Runs for the Joes, bad luck for Jennings and a big lead for England... all you need to know from day three of the third Test in St Lucia. 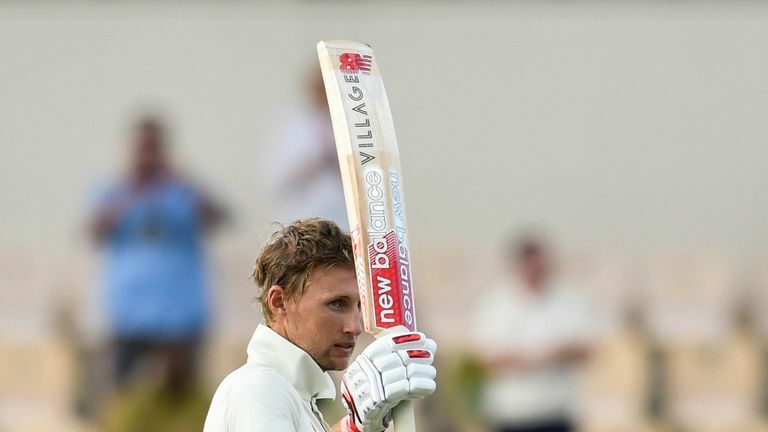 Joe Root struck his 16th Test century as England enjoyed their best day with the bat in the series against the Windies to earn a commanding 448-run lead in St Lucia, writes Kalika Mehta. Cries of 'ROOOOOOOOOOOT' echoed around the stadium as the visitors' captain hit a full toss from Alzarri Joseph down the ground for four to bring up his hundred off 189 balls. Joe Denly (69) and Jos Buttler (56) also hit half-centuries as England ended day three 325-4, with Root unbeaten on 111, having benefited from seeing the hosts lose seamer Keemo Paul to injury in the first hour of play. Denly's cover drive off Kemar Roach to bring up his first half-century in Test cricket was a delight to watch - not just as an aesthetically-pleasing stroke, but also because of his understated reaction. You might have expected frenzied celebrations from a top-order batsman who waited so long and patiently for his opportunity at the top level, yet hadn't mustered a significant score in his first three Test innings. But there was little more than a grin of relief on Denly's face and a token fist pump with batting partner Joe Root - suggesting that he knew 50 represented the first step towards a potential century, no more. It wasn't to be on this occasion, but Denly may at least have given himself a chance of being handed further opportunities to become a Test centurion. England's eventual second-innings total will be their highest of the series - beating the 277 all out they posted in the first innings of this Test. Root's century was his first in eight Test innings - in fact, the England captain had failed to reach 50 since his ton in the second Test against Sri Lanka at the end of last year. 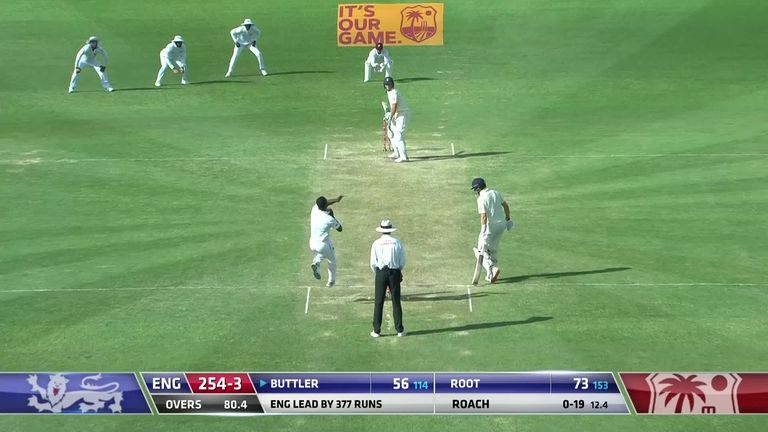 Root becomes only the eighth England skipper to score a Test hundred in the Caribbean. Colin Cowdrey and Andrew Strauss achieved that feat three times, with Len Hutton and Michael Atherton doing so twice. Maybe it was the security of holding a healthy first innings lead for the first time in this series, but it was encouraging to see England's batsmen finally prioritise occupation of the crease over flamboyant strokeplay. In particular, Root and Buttler took very few risks, playing the majority of deliveries on merit and looked content to accumulate gradually and grind the Windies down during their century partnership. The genius Joe Denly has brought up his first Test half-century with a scrumptious straight drive to the boundary. Noice. If Keaton Jennings can't score the daddiest of hundreds here, he needs to go out in a blaze. Joe Root: "It felt a long way off at the start of this game, after some of the deliveries I got in the last Test. It's really pleasing to make a start count, I'm glad to have got in and made it count when I got the chance. "Today something really clicked in - I've been working hard with Ramps [Mark Ramprakash] and some of the other coaches. It's nice to see it work and hopefully that'll be a good foundation for a long time to come. "It wasn't pretty at times, it was that sort of wicket and obviously a slow outfield but once I got into the rhythm of the game, it started to feel a little bit easier." Michael Atherton: "He (Denly) looks the part, is an elegant player, stands tall, played some lovely shots through the offside off front and back foot. Most batsmen on this pitch, with this outfield, have struggled to hit boundaries and play fluently and Denly probably timed the ball as well as anybody. "He didn't look overshadowed when batting with Root, who is really experienced at this level. His 69 is a good score but not the kind of score that is indelibly going to put his name on the teamsheet. By the time August comes around, this game will have almost been forgotten. "We will have had the World Cup, there are nine or 10 Championship matches before the first Ashes Test and he needed 150 to really say 'that's my spot'." Nasser Hussain: "Keaton (Jennings) was hugely unlucky to get bowled off his thigh pad. There are so many cricketers that come to this level from county cricket, there has been a repetitive nature of dismissals over the years and not many players do change how they bat. "Part of the problem is county cricket is a bit of a grind and coaches just continue to almost do the bad habits. Players don't have the time to take themselves away and correct such a major technical issue. "The County Championship starts again in March - has Jennings got time to change such a technical failing of not being able to drive the ball through the extra cover region?" Watch day four of the third Test between Windies and England, in St Lucia, live on Sky Sports Cricket from 1.30pm on Tuesday.